I am physically incapable of working while the catchy strains of Doc McStuffins waft from television speakers before me, while my children play a rousing game of Trouble next to me, while the phone is pinging, the doorbell ringing and the dryer is buzzing. I need to be able to concentrate and work in solitude to perform at my best. So why would I expect my children to do their daily homework surrounded by distractions? 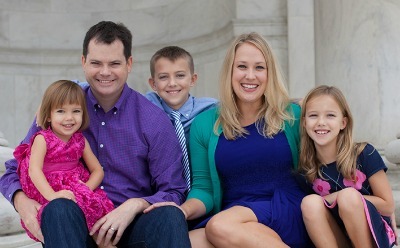 I had to own up to this contradiction this school year when I realized that our family’s tradition of a group homework session at the kitchen table – the hub of our home – was no longer a healthy learning environment for my fifth and third grade children. Charlie and Eve both need individual disturbance-free spaces to complete their increasingly complex assignments. Now that they are strong readers and at ages in which learning personal responsibility is imperative, the kids no longer need me hanging over their shoulders to help them through each step. My job is to be available when assistance is requested. My additional job is to proctor preschooler Alice’s own “homework”: allowing her siblings some space and peace from her shenanigans while they work. When I discerned that Charlie and Eve were in need of quiet homework spaces, I started to sweat it. I imagined those positively perfect, professionally-designed education stations from Pinterest and the Pottery Barn Teen catalogs. Do we need to remodel? Should we convert our family room to a school room? Maybe a local college would sell me a few library carrels? 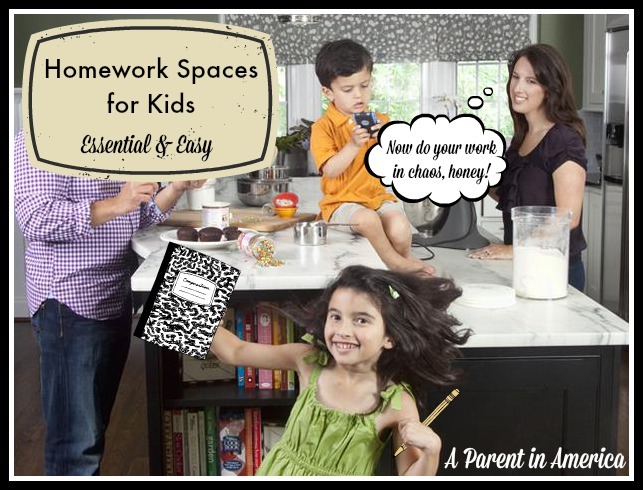 Thankfully, I found on the National Education Association’s (NEA) Parents Page a great deal of resources to help me establish effective homework areas for my kids. The advice was simple, sane and talked me off the ledge. That is it. No special furniture or Nate Berkus required. You can create a simple, effective study space almost anyplace in your home; you do not need a special or separate room. 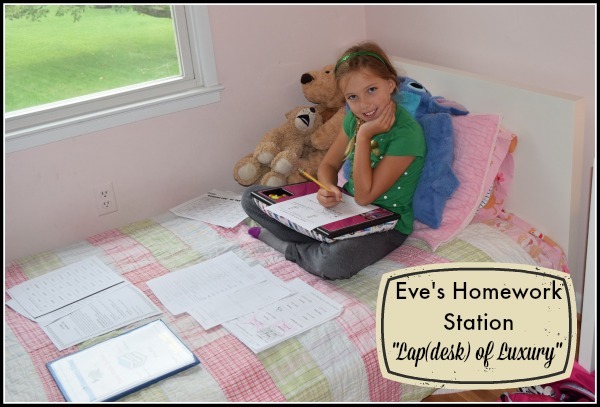 Charlie and Eve have their own bedrooms, so we set up their homework stations there. I talked with each of the kids individually about how they like to do their assignments and how their bodies feel most comfortable doing their work. The NEA says that kids can be free to decide how they learn best and that lying on the floor or sitting on the bed is completely fine, and it is a choice parents can leave up to the kids. Fifth grader Charlie determined that he preferred to write, work and type at a traditional desk, but complete independent reading on his bed. 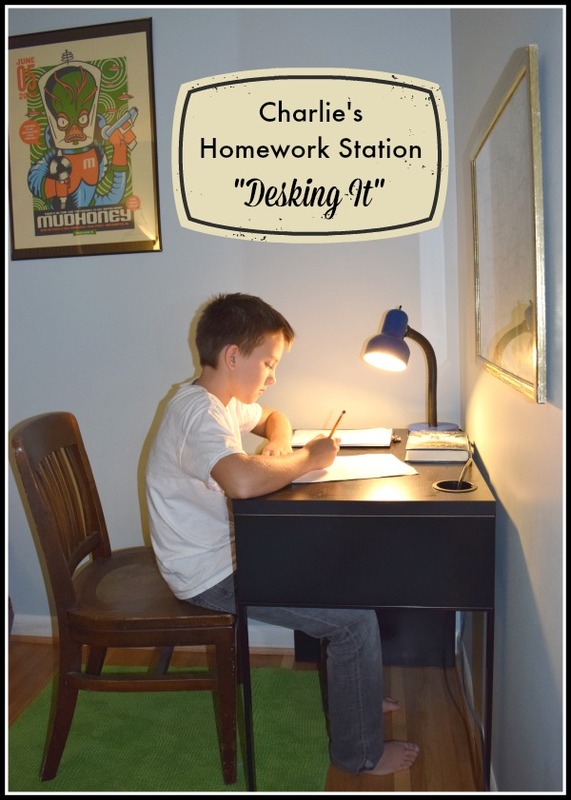 With one re-appropriated chair (the one I bought for my own desk back in 1998 at the Georgetown flea market, ah, memories) and an IKEA desk, Charlie’s bedroom homework station was simple to create. He already had a gooseneck lamp and we filled the desk drawer with necessary supplies. We opted against keeping a computer permanently in his room at this time, but he is free to “check out” a family laptop or netbook from my office when he needs. Although we had planned to purchase Eve a desk, too, she said that she would rather have more bookshelves in her room, and that she feels most comfortable working on her bed for daily spelling, math and reading assignments. She said that she likes the light from her window and bedside bookshelf, that she likes that she can close her door against her pestering sister. All Eve needed was a a simple lap desk (she chose this one, very sassy), a pencil box stocked with provisions and firm pillows to support her back. Studying on the bed is fine, if that is where your child feels most comfortable and ready to learn. 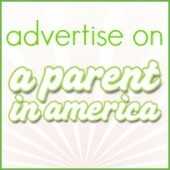 The NEA expert articles endorse it! The NEA experts even say that if your child studies best while soft music is playing, it is fine to allow. The most important factor is for your child to spend some time discerning where and how she would most like to complete her homework each day. The NEA Parents Page is full of more easy, non-threatening, totally helpful tips for parents to help your children do well in school and perform their personal best. I hope their words help your family as much as they did mine. Disclosure: This post reflects a collaboration with the National Education Association’s Raise Your Hand for Student Success campaign. All thoughts and opinions are, of course, my own.